A major automobile manufacturer experienced trouble when it began to run multiple models with different body sizes on its paint priming line. The AOD pump used to refill the paint level after each vehicle was dipped was not precise enough with one model. Expanding the number of models and body sizes made the situation worse, and the primed automobile frames fell out of specification. 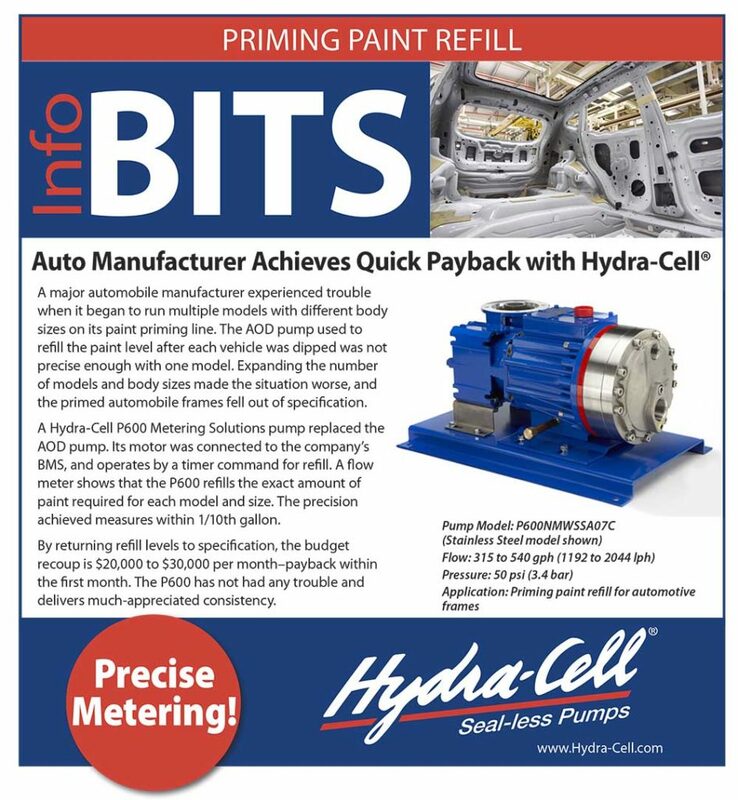 A Hydra-Cell P600 Metering Solutions pump replaced the AOD pump. Its motor was connected to the company’s BMS, and operates by a timer command for refill. A flow meter shows that the P600 refills the exact amount of paint required for each model and size. The precision achieved measures within 1/10th gallon. By returning refill levels to specification, the budget recoup is $20,000 to $30,000 per month–payback within the first month. The P600 has not had any trouble and delivers much-appreciated consistency.